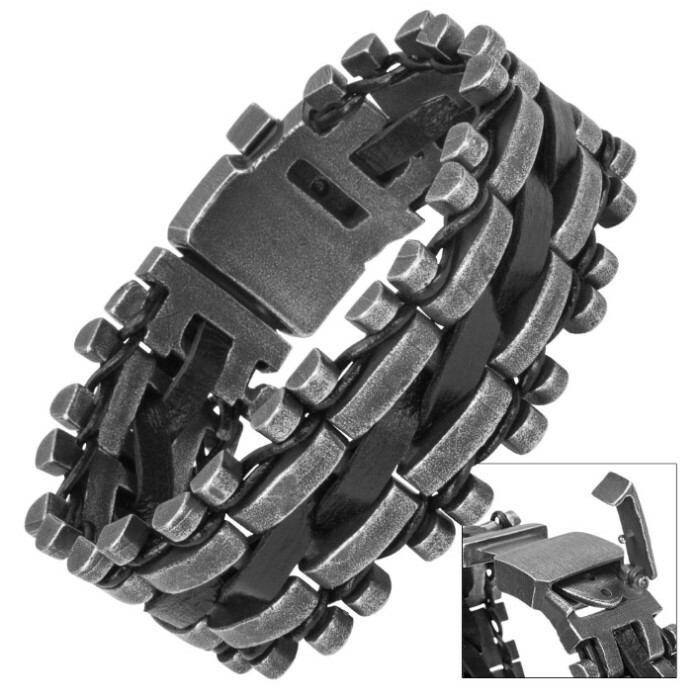 Loaded with bleak-chic industrial style, the deliciously dark "Iron and Hide" Bracelet is perfect for bikers, heavy metal fans, goths or anyone whose sense of fashion is unapologetic and in-your-face. It features an interlocking chain of matte gray steel bars, intertwined with tough black genuine leather. 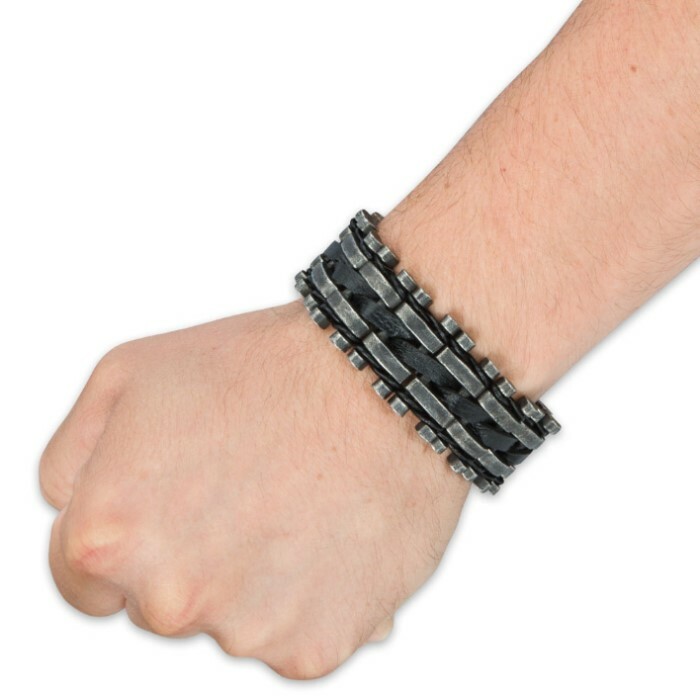 A convenient adjustable buckle clasp holds the bracelet securely in place but is also quick and easy to remove. Its high quality leather and stonewashed stainless steel construction boasts corrosion resistance and durability that simply can't be matched by more traditional - and, not to mention, expensive - jewelry materials. Precious metals like silver and gold tarnish and scratch, and even advanced modern ceramics are prone to chipping. But the Iron and Hide Bracelet is carefully crafted for a lifetime of vigorous wear. 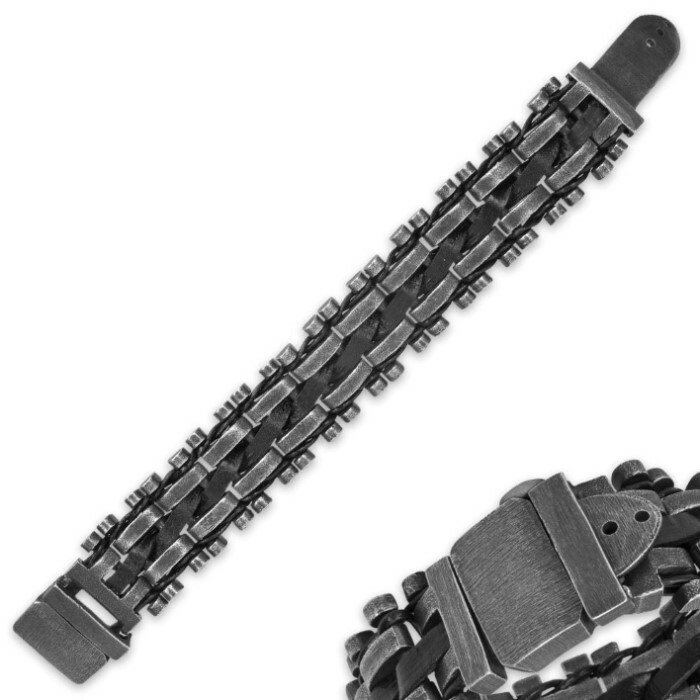 At 10" overall, it easily fits most arms, especially with the adjustable clasp. The Iron and Hide Steel and Leather Bracelet makes a fantastic, memorable gift, and you won’t find better prices on fine jewelry like this anywhere else!